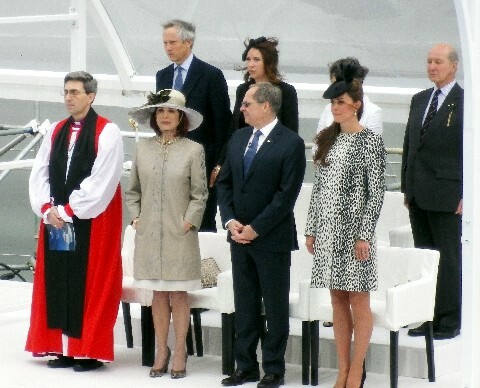 When the new 3,600-passenger Royal Princess was christened by Her Royal Highness The Duchess of Cambridge in Southampton, England, last summer, it marked the first new “Love Boat” for Princess Cruises (www.princess.com) in more than five years. She then proceeded to cut a rope that sent a huge Nebuchadnezzar-sized bottle of Moët & Chandon champagne hurtling toward the 141,000-ton ship. A godmother is the symbolic patron of a ship and embodies the spirit of the vessel. In the past, Princess chose Audrey Hepburn, Sophia Loren, Dame Margaret Thatcher, Olivia de Havilland and even Diana, Princess of Wales (who named the first Royal Princess in 1984) to christen its ships. Through April 20, 2014, the ship will operate eastern Caribbean sailings from Port Everglades in the Greater Fort Lauderdale area. On those cruises, Royal Princess will call at Princess Cays (the line's private island experience) in The Bahamas; St. Thomas, U.S. Virgin Islands; and St. Maarten, an island that reflects both French and Dutch culture and heritage. This newest "Love Boat" seems well-suited for those seeking a warm-weather Caribbean cruise as it has a wealth of balcony staterooms. 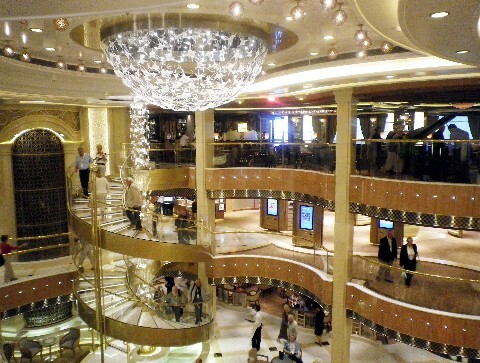 Of 1,780 staterooms, 1,438 of them have balconies. 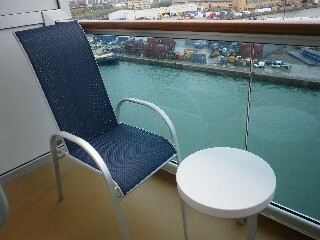 In fact, all outside staterooms on Royal Princess feature a balcony. The ship has 730 standard balcony cabins, 358 expanded deluxe balcony cabins (a new category for Princess), 314 mini-suites and 36 suites. 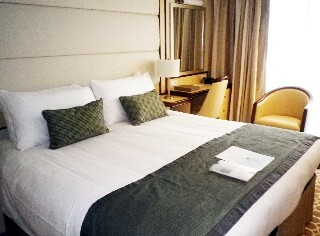 Our standard balcony cabin felt spacious and was well-appointed. 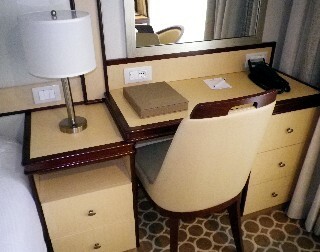 In addition, the ship's 342 inside cabins will appeal to "first timers" eager to try a cruise and see if they like it, or for those simply seeking a good value. We sailed on the ship in fall 2013. Here's our first-hand look at the ship and tips if you opt to sail. 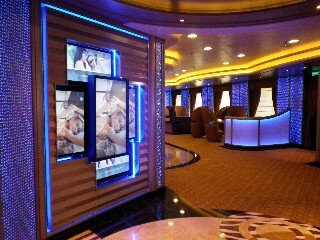 Royal Princess has innovative features that should appeal to both veteran and first-time Princess Cruises passengers. Without a doubt, the most-talked-about feature is the over-water SeaWalk. 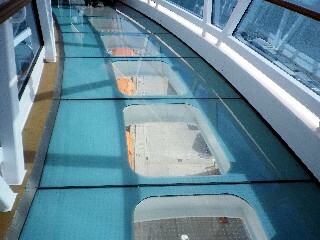 High atop the ship, this glass-bottom, enclosed walkway is on the ship’s starboard side -- extending 28 feet out over the water. So you walk through the SeaWalk, step onto a glass floor and look down to the ocean 128 feet below. For most passengers, it's a "must do" but those with a fear of heights may want to steer clear. 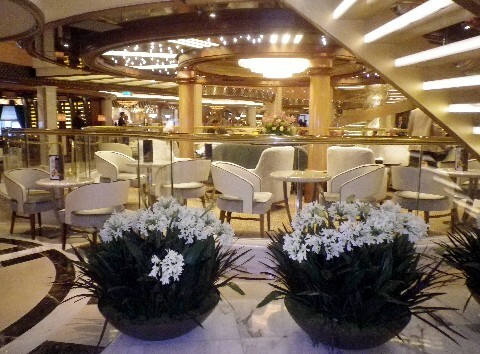 We particularly liked the portside SeaView Bar that juts out from the ship's opposite side. It's a good spot to enjoy drinks with Caribbean views. 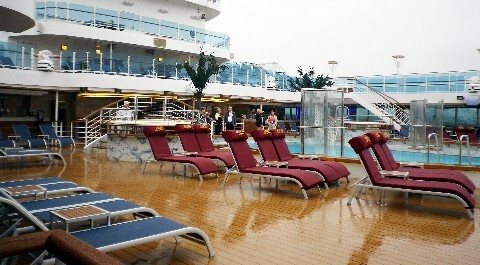 Extending three decks upward from Deck 5, the dramatic Grand Piazza or atrium extends across the full beam of Royal Princess. The Grand Piazza is a vibrant social hub for Princess passengers and boasts 50 percent more space than the atriums of other Princess ships. As a result, it's the elegant, see-and-be-seen spot for guests to enjoy beverages, snacks and light meals, live entertainment and shopping. New atrium spaces include Bellini’s, an Italian-themed cocktail bar, as well as Alfredo’s pizzeria. The pizzeria's casual sit-down space features complimentary personal pizzas with fresh toppings and a small selection of appetizers and pastas. In the Grand Piazza, you'll also discover seafood and sushi/shashimi at the new Ocean Terrace seafood bar. 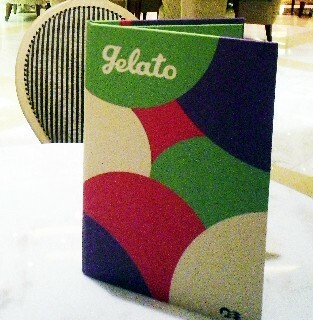 One of our favorite spots around the ship was the atrium's colorful new gelateria aptly named Gelato. It's the place to order Italian crepes, smoothies, shakes, waffle ice cream cones, and, of course, lots of varying gelato choices we grew to love. The menu (shown at right*) offers gelato in vanilla, strawberry, chocolate, cookies & cream, Dulce de Leche, chocolate mint chip, Nutella and butter pecan. To those flavors, you add what you like in terms of sauces (caramel, fudge, melba and more) as well as toppings. Fees apply for Gelato orders but the prices are reasonable. For $2.75, you receive any three scoops of your choice plus toppings. All gelato is hand-crafted daily by the ship's pastry chef. Guests may also order yummy crepes and sundaes, also for $2.75. Alcoholic sundaes are available for $6.50. 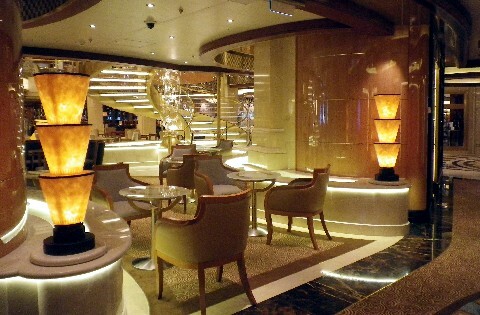 Of course, those who prefer also have Scoops on Deck 16, which offers complimentary soft-serve ice cream. 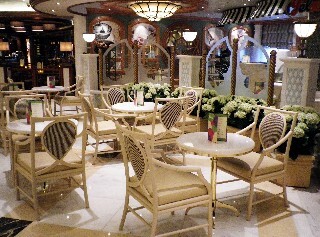 Perhaps the most popular area of the Grand Piazza, though, was the expanded version of the line's International Café. 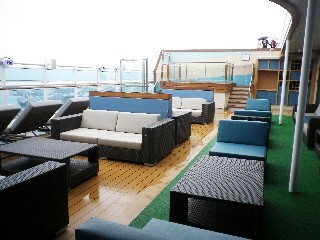 Boasting more seating than similar venues on other Princess ships, this place is highly popular for morning coffee and pastries as well as afternoon drinks. It also serves beverages, snacks and even light meals. Nearby, Princess has added the Tea Tower with a diverse selection of more than 250 tea blends. Guests also benefit from the advice of a "tea sommelier." In addition, a new "Royal Afternoon Tea Experience" is inspired by London's famed afternoon tea destinations. 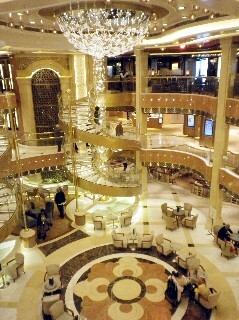 We indulged in the tea service and found Royal Princess to have some of the best options afloat. During the tea experience, guests savor fresh berries and cream; warm raisin and plain scones, served with strawberry jam and Devonshire clotted cream; Queen of Puddings, which is a traditionally baked British dessert spread with jam and topped with meringue; and finger foods including cucumber with cream cheese on caraway seed bread, chicken with wholegrain mustard mayonnaise on basil focaccia and smoked salmon on a French baguette; among other delights. Cost for the Royal Afternoon Tea Experience is $10 per person or $20 if you want to splurge for champagne. 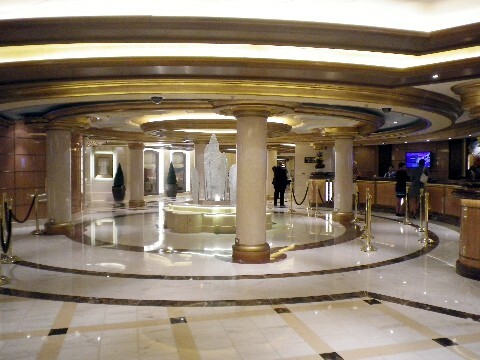 What you won't find in the Grand Piazza is the Passenger Services Desk and Shore Excursions Desk. Those more "business focused" areas have been moved into an adjacent mini-piazza (shown in the photo at left.*). The two customer service desks encircle a small fountain. In this area, you'll also find the entrance to Sabatini's, Princess' popular alternative Tuscan-inspired restaurant. One nice feature is that Sabatini's is now adjacent to the Vines wine bar, so it's great to enjoy a cocktail or glass of wine and then head next door to dinner. Celebrations Gift Shop is a new Princess Cruises shopping option. It sells premium chocolates and other sweets, flower arrangements, and many other gifts perfect for celebrating that special anniversary, honeymoon, birthday, family celebration or graduation. 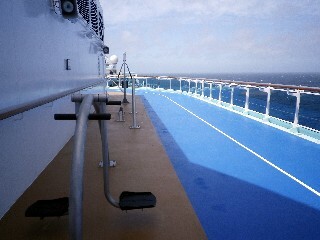 On Deck 7, Princess Live! is a new entertainment/activity concept for Princess. We liked this colorful space and returned here often. (The Princess Live! entry area with cool blue lighting is shown in the photo at left, while the television studio/theater area is shown in the photo above*). 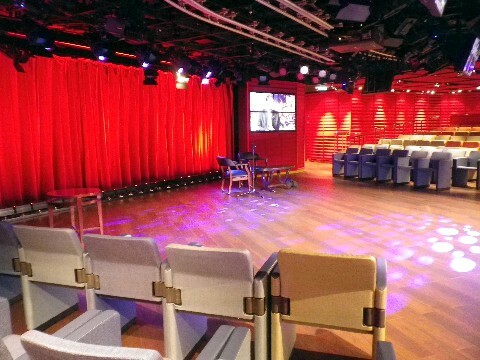 Essentially, it's a television studio with theater seating for guests. This is the place for enjoying broadcast-ready entertainment options, traditional lectures, late-night comedy performances, game shows and culinary demonstrations. 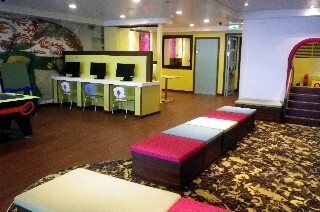 One popular Princess mainstay is the Lotus Spa, which has a new location on Royal Princess. Guest feedback has shown that cruisers taking spa treatments aren't looking at the windows, so the line has moved the spa from that "prime" real estate to a lower point in the ship on Deck 5. The good news is that it's now in a very accessible location -- just off the mini-piazza and the Passenger Services Desk area. 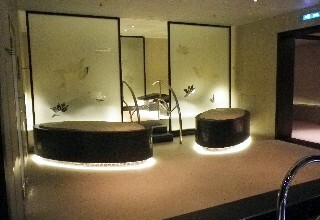 So guests walk by the spa entrance while strolling to the elevators. Princess believes more guests may take advantage of the spa services, as they walk by -- rather than having the spa "cocooned" in a less well trafficked area of the ship. Highly serene in ambiance, the Lotus Spa is home to pampering, private couple's villas (shown in the two photos above*) In addition, this spa has more treatment rooms than similar spas on other Princess ships. 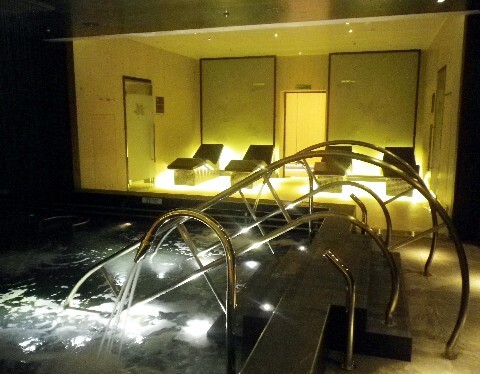 Around the hydro-therapy pool guests will discover loungers, humidity zones and aroma infusers. New features to the Enclave include a Turkish-style Hammam (steam bath); warm, light-steam Caldarium (a ceramic chamber); a warm dry Laconium to help purify and detoxify the body; and your choice of a sensory shower -- tropical rain, cold mist, rain or Siberian are the choices. 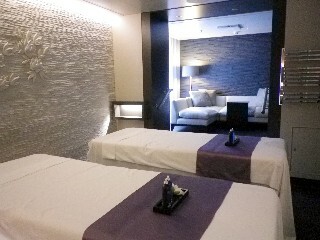 We took advantage of several spa specials when the ship was in a port we had previously toured. Port days typically are less pricey for spa services as demand is less as guests leave the ship for tours, beach time or shopping. When it's time for dinner, guests dine in one of three main dining rooms on Decks 6 and 7. 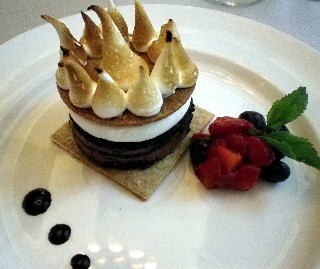 We dined at The Allegro (shown in the photo above. 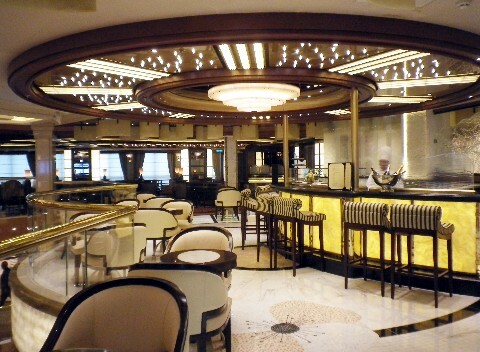 *) This restaurant serves as the ship's traditional dining venue for guests who have selected "fixed seating." 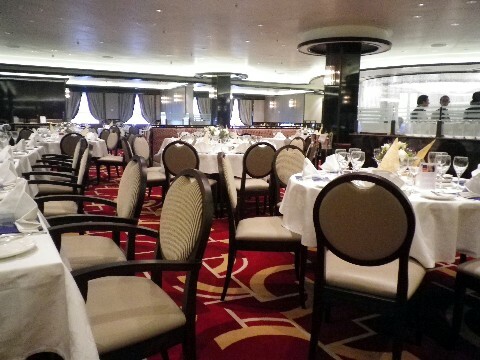 Allegro hosts both an early and late seating; guests dine with the same tablemates throughout the cruise. This restaurant is also home to Chef’s Table Lumiere, a specialty culinary experience that "foodies" on our cruise raved over. The Chef's Table Lumiere is a large oval table offset from other tables in the main dining room, yet just steps away so guests don't feel pushed aside to a back room. Instead, guests dine in an elegant venue with shimmering privacy curtains, a custom-made wooden table and a Murano-glass sculpture centerpiece. Prior to dinner, guests are invited into the galley for a tour and drinks with the chef or his team. Then they head for the dining room. Seated within the Chef's Table Lumiere space, they dine on special chef-selected dishes prepared just for the occasion and also enjoy fine wine pairings. 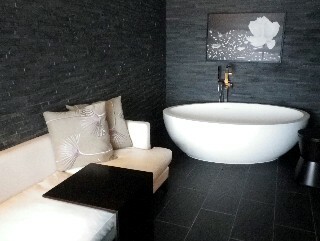 Just 10 guests can be accommodated for this experience at one time. This culinary experience is typically offered once each evening of the cruise; cost is $115 per person. For those who love flexible dining times, the Symphony and Concerto dining rooms welcome "Anytime Dining" passengers with newly expanded hours. Passengers who have selected Anytime Dining can just show up for dinner at either of the two restaurants. It's just important to arrive during the eateries' range of dining hours. You can't just show up at 11:30 p.m. or 3 p.m., for example. 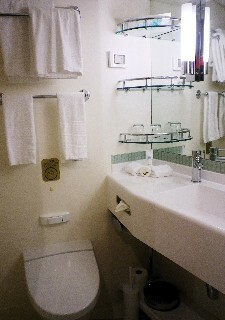 But the flexibility for dinner is advantageous, particularly for people with long tours. You might dine at 6 p.m. on a sea day, but 8:30 p.m. after returning from a full day's tour. If there is a short wait, you'll receive a pager. You can enjoy a drink in a nearby lounge or stroll to the shops until your your table is ready. Symphony and Concerto also host the ship’s Wine Maker’s Dinner, which takes place in a circular area within both dining rooms; you're surrounded by walls of wine bottles and you can expect another special meal paired with wines. Specialty dining continues with the Crown Grill, adjacent to the Wheelhouse Bar. Here, an open kitchen serves up premium Sterling Silver steaks, chops, and fresh seafood. Though most first-timers order the great steaks, we highly recommend whatever fresh seafood the chef is preparing that evening. Editor's Note: One unique facet of the dining experience is a complimentary offer of blended salts for guests to select, if they choose. As previously mentioned, Sabatini's, located in a mini-piazza just off the Grand Piazza, offers Tuscan cuisine. This alternative dining venue, carrying a charge of $25 per person, is open for lunch and dinner. Sabatini's centerpiece is a grand wine display, offering an impressive selection of Italian varietals and Super Tuscan blends – including Chianti, Sangiovese and Brunello di Montalcino. What's new for Sabatini's? 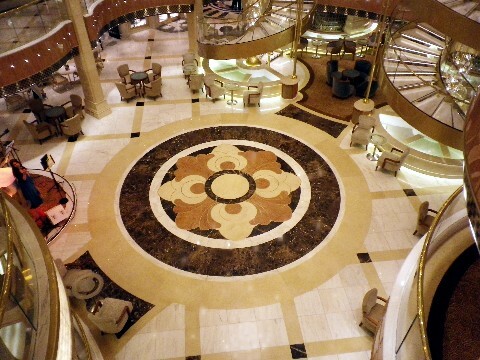 Royal Princess' Sabatini's is 50 percent larger than the same dining venue on any other Princess ship. Yet, you'll find the same "a la carte" Italian favorites. 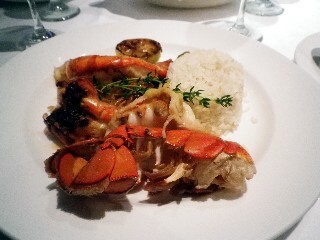 Editor's Tip: If Sabatini's offers the whole salt-crusted sea bass on your Caribbean sailing, it's highly recommended. The expanded Vines wine bar offers unique wines by the glass and bottle, as well as flights of wine. For those enjoying the fruits of the vine, Vines serves up complimentary small plates that provide an appetizing “taste” of the nearby Sabatini’s. Princess' complimentary "pub lunch" proved highly popular when it debuted in 2008. 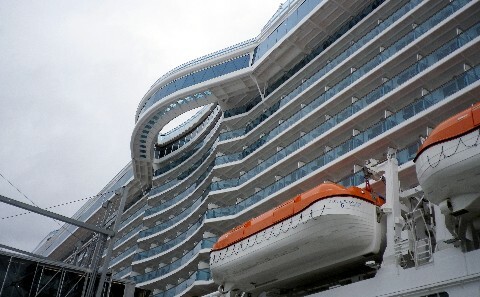 That concept has been expanded on Royal Princess. It's offered in both the Wheelhouse Bar and adjacent Crown Grill. The traditional pub-style lunch is featured on sea days, while fish and chips and a ploughman’s lunch are offered up on port days. If you so desire, order a British or Irish beer. For us, that's Guiness. 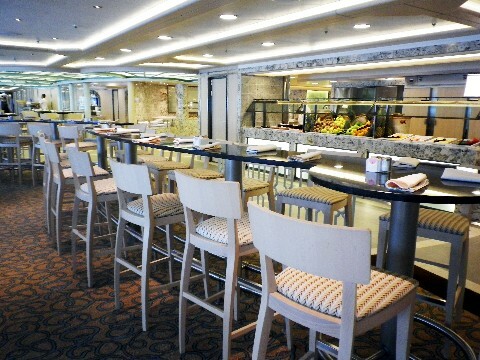 Nearby, the expanded Horizon Court buffet is bigger and better than ever, with several new elements for this ship. Horizon Court now has live cooking and serving stations including a a rotisserie, hibachi grill, pasta and salad stations, and rotating Asian and Mediterranean areas. A dedicated Pastry Shop is nearby; bakers are in action day and night. We found the new food stations fostered a very good traffic flow. We encountered fewer lines for casual dining than we've experienced in the past on other similarly sized ships. Do you enjoy colorful events and dining with a theme? The Horizon Bistro features such nightly themed events as a Brazilian churrascaria, French bistro, German Beer Fest and more. For a fee of $20 per person, Horizon Bistro also offers two new specialty dining options on certain evenings. One is a seafood-focused Crab Shack night and the other is Fondues, which fields an evening of appetizers, fondues and desserts. The fondue experience was tasty. We dined once at Crab Shack and also came back a second time when the operation was moved outside so guests could enjoy the great weather. Whether you love to board a ship and just relax or you prefer a fast-paced schedule of activities from morning until night, Royal Princess has myriad choices. It's easy to leave any stress at the door when entering the pampering Sanctuary and Retreat, a relaxing enclave designed just for adults. 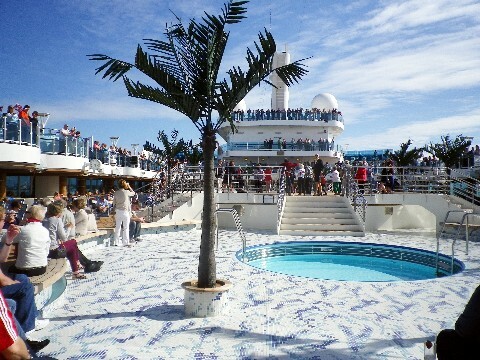 Those who enjoy activities might head for the ship’s busy central pool area (a portion of that is shown in the photo above*), which also offers a new attraction -- daily and nightly performances. Reflecting four separate themed sequences, the new attraction consists of dancing fountains (when the line removes the upper deck flooring), special music and "live" music performances. Also fun as an outdoor activity? 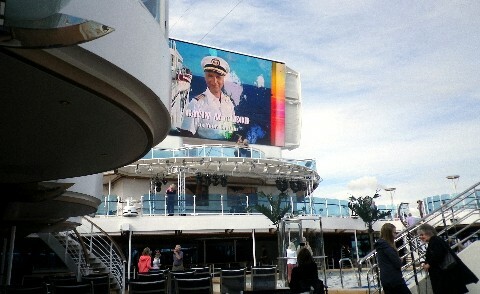 During good weather, guests may watch Movies Under the Stars as well as certain television programs and sporting events on the ship's huge outdoor high-resolution video screen. If you're traveling with kids in tow, Royal Princess also has extensive children's program spaces and a robust supervised activity program. 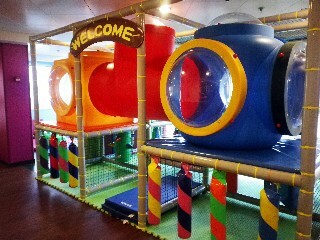 (The children's facilities on Royal Princess are shown in the photos at right and immediately below). 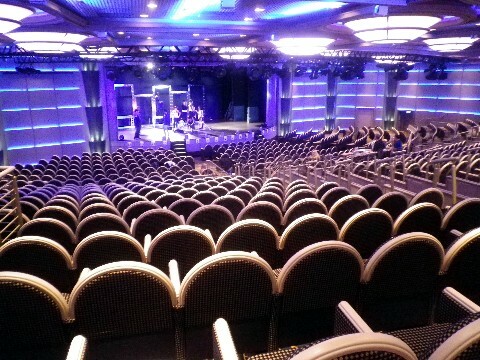 Large theater with excellent sightlines (as shown in the photo below), to name just a few of the many other diversions. Some of these attractions (for example, the theater or golf-putt-putt course) welcome families as well. 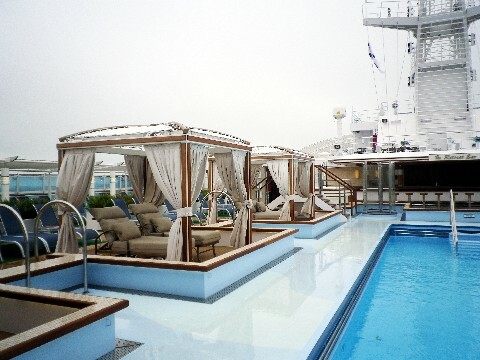 While Royal Princess sails from Port Everglades in Greater Fort Lauderdale, FL, this winter, it will return to Europe in summer 2014 -- operating cruises to Scandinavia, the Baltic Region and Russia. Thankfully, though, later this year, the ship will return for a second Caribbean season of roundtrip sailings from Port Everglades. Between Nov. 4, 2014 and April 28, 2015, it will sail alternating, 10-day eastern Caribbean sailings. Ports of call will include include Antigua, St. Lucia, Barbados, St. Kitts, St. Thomas, and Princess Cays, or alternatively, Princess Cays, St. Thomas, Dominica, Grenada, Bonaire and Aruba. Cruisers might also choose a 10-day "Caribbean Islander" sailing from New York to Fort Lauderdale on Oct. 25, 2014 with calls at St. Thomas, Antigua and Aruba, or a five-day eastern Caribbean sailing on Dec. 4, 2014, roundtrip from Fort Lauderdale to Princess Cays and Grand Turk. With so innovative new spaces and upgrades to traditional spaces already beloved by Princess fans, Royal Princess is likely a good option if you're considering a premium-style, warm-weather cruise from South Florida to the Caribbean. So stroll the bit-scary-but-fun SeaWalk. Dine at the savory Chef's Table Lumiere. Enjoy dancing waters and broadcast entertainment in Princess Live! Celebrate the "Love Boat" spirit but in a modern, updated way. And pick from a wide selection of balcony accommodations, assuring you'll have the perfect perch for watching the sun set over tropical isles and azure waters. Most importantly, sail from an easy-to-reach U.S. home port at Port Everglades, with at least two winter seasons of voyages to islands in the Caribbean. *All photos in this article are owned, copyrighted and used courtesy of Susan J. Young; all rights reserved. Please do not link to nor copy these photos, which were taken onboard Royal Princess in June 2013.